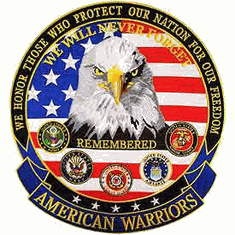 ArmyDecals is proud to offer this American Warriors Jacket patch by Eagle Emblems. Embroidered with the five branches of service and the Great Symbol of America the Bald Eagle and the American Flag, this jacket patch's quality is guaranteed! We honor those who protect our nation for our Freedom!